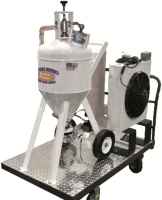 Looking For New or Used Sodablasting Equipment in Georgia? See the BB-100 for more details. Click here to view our brochure. 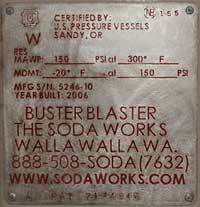 The Buster Blaster 100 is the only true Soda Blaster. It operates using a patented, self-cleaning venturi that requires little or no maintenance. 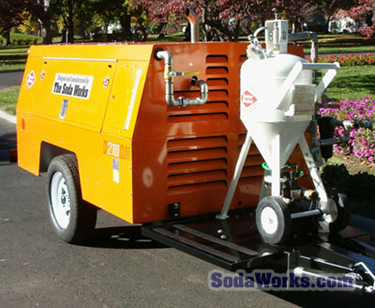 The venturi combined with the metering system in the Buster Blaster soda blaster virtually eliminates downtime because of clogged lines and will deliver a precise and even flow of the blasting medium (Natrium Soda Blasting Medium) so you can complete your work on-time and on budget. A properly adjusted Buster Blaster soda blaster will reduce your use of soda by 20% and still have better on-the-job performance than any modified Sand Blaster. This unit is identical to the Eco-Packwith the exception of the accessories and the fan coolers are sized to use a larger #5 blast nozzle.